I had planned on writing this post last Tuesday. I guess I thought I'd be able to write it that night as I ate ice cream and watched the election results come in. I was assuming Hillary would win- anxious, a little sick over the whole thing, yet pretty confident. But then, well, you know. It's a week later and I can't really think much of anything other than the election on so many levels, so I'm writing this after all. I bought this book probably seven or eight years ago from my library. It was part of a sale to clear out old books, and I doubt I paid more than a dollar for it. I'd read this book before, years earlier. I don't think I had yet graduated from high school when I checked it out from the library. I loved reading about people and she intrigued me. I actually had it checked out for a few years as I moved around to go to college. It's telling of the small, conservative town I grew up in that no one ever attempted to check out the book during that time, and that no one cared that it had been out for years when I finally realized I had it and returned it. Hillary's fan base there was small, if it existed at all. And really, it's entirely likely it ceased to exist after I moved away. The woman who had previously owned the copy I'd bought, however, was a huge fan of Hillary Clinton's. That much was clear. It was also pretty clear that this book had never made it into circulation once donated to the library I purchased it from. Inside the book were several articles, carefully clipped and folded, spanning from the mid 90s to 2005. They read of Hillary's accomplishments, and the pushback she faced, and would likely continue to face, as a woman. A note written on the sales receipt for the book and taped inside the front cover indicated that it was a gift for the owner's 78th birthday in 2003. There were a couple of postcards sending thanks for support from Friends of Hillary, with a name and address. Curious, I called on the powers of Google. The woman had been a force for good in the Democratic party of Utah, which as a woman in Utah says a lot. Reading through the book with her ink in the margins made me feel as though I was studying under the mentorship of someone who had walked the same path before. I realize how strange it sounds, but it was inspiring. I'm sure I would have held onto the book anyway, but the personal story of a stranger woven throughout has made it all the more fascinating to me, and so it's stayed. I pulled it out again, just before this election. I thought of what the woman who received it as a birthday gift would have felt. I imagined she would have been elated to see HRC finally getting her chance. I imagined a sense of sisterhood, a sense of pride. I felt proud, too. I admit, I was initially pulling for Bernie. A good portion of my pull for Hillary was to stop the GOP, but I did believe in her. I believed in her qualifications and capabilities, and I believed in her example of a lifetime of hard work, perseverance, and rising above. My five-year-old believed in her. She spent months talking about her, as though they were teammates fighting for the same goal. On election day, she woke early, dressed in head to toe blue "for Hillary," and announced that she was not going to school because she needed to vote. Jason took her with him before dropping her off at school. She proudly wore her "I Voted" sticker all day, and could talk of nothing else. As I got ready to go cast my own ballot that night, I felt a little overcome with emotion, and it wasn't all completely nerves. The fact that my children would know a Black president and a female president as normal was not insignificant. For as long as it's taken to get to this point, and for all that we have yet to overcome, we're working toward that direction. It's not without sacrifices, but it's not without hope. Chipped, picked off nail polish courtesy of anxiety. I tucked the book into my bag before I left. The woman to whom it belonged was born only five years after the 19th Amendment was ratified. She spent a good portion of her adult life as an activist, and at least a decade investing in, supporting, and endorsing Hillary. I can only imagine what she would have felt at finally having the chance to vote for her in a presidential election. It only seemed right to bring it along. I thought of her as I cast my vote- years of her life dedicated to getting to this point. I thought of my children- of them always knowing that women are capable, of never questioning whether or not their dreams are attainable for lack of representation. I was hopeful for a victory. I was almost confident in one. While we didn't get it, I don't really think we lost. The story of a woman becoming President of the United States didn't start with HRC. It goes back before her, before any woman who tried. It started before suffragettes, and before the generations that raised them. From the beginning of time, women have been erased from history. They've been removed from textbooks, history books, scripture, and early temples. Their voices are quieted and their accomplishments credited to men. Just as the pursuit of power didn't start with Hillary, it's not going to end because someone else was elected (yes, I'm intentionally avoiding addressing him in this post). There will be a woman president; it's a day I look forward to. It's a day that has been worked for by many, and that many others continue to work toward. 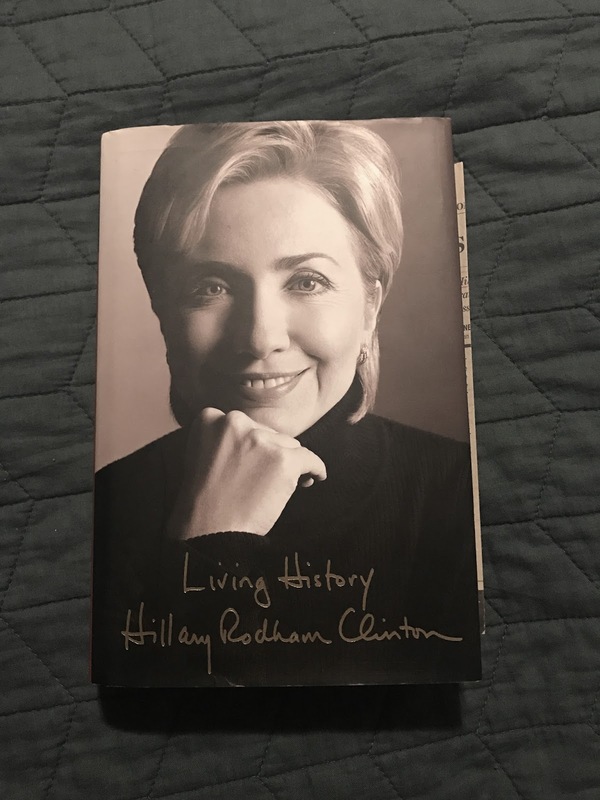 I might still be high on the sisterhood illusion, but I envision the woman who carefully clipped every article she found about Hillary, tucking them away in the book she received for her 78th birthday, wondering if it just might happen in her lifetime. She had so much hope. I think of my daughter, five-years-old, practically out campaigning for Hillary, with no reason to question the significance of a female president. She, and her sister and brother, are why I hope. I think of the generations in between the two. There's so much responsibility there to bridge the gap between hoping for a better future and creating an environment in which those we place our hope can thrive and succeed. We need to step up, but many are swimming in denial. Some say this country isn't ready for a female president. They're the same people who criticized Hillary's tone, her facial expressions, her wardrobe. Women are plenty ready, plenty capable, plenty qualified. We're standing, waiting to shatter that glass ceiling, for lack of a less tired metaphor, but we're being handed glass slippers instead. Shattering that ceiling would shatter the patriarchy and no one knows that better than those feigning encouragement with a heavy side of, "She should smile more," and "It's not the right time. It's time to normalize female accomplishment. Celebrate it, yes, but normalize it. It's time to recognize ingrained misogyny, to call it out, to do away with it. It's time to ensure both girls and boys understand how ridiculous the phrase, "Girls can do anything boys can" is. It's time to teach children that girls are not inherently emotional, fragile and weak, and boys should not be held to an absurd standard of machismo. Written on a scrap piece of paper and taped to the back cover of the book is a quote from Bill Clinton's first acceptance speech. It reads, "There is nothing wrong with America that cannot be cured by what is right with America." There's a lot that is wrong with America. But when I think of what could possibly be right, and right now I have to think hard, I think of hope. Hope isn't going to make this all okay, but it gives us something to unite in, and something to work for, and that is how we're going to get through this.